No matter the type or size of your business, the tax man will come knocking on your door when tax season comes among us. It is always best to have your books in order and up to date when that time comes. We are aware this may seem like a hassle to keep up with yourself, but by following our tips below you will be on your way to better, more organized accounts this year and a more successful business. Becoming and remaining organized is incredibly important when it comes to keeping your finances in order. The good news is, this doesn’t have to be a difficult task. Keeping up with basic spreadsheets showing all of your funds received and funds paid out is a simple way to track your finances. At the end of every month, check to make sure your records all align with the money in your bank account to ensure balanced accounts. We understand that handling your financials is not the easiest task to take on by yourself, which is why we always recommend hiring a professional accountant in your area to take care of the dirty work for you. Through hiring a professional, you can rest assured knowing your accounts are in good hands and you are up to date with all rules, laws, and aren’t missing out on any tax allowances. Through hiring an accountant, you can put all of your attention on growing your business. There are many benefits when it comes to separating your personal and business finances. 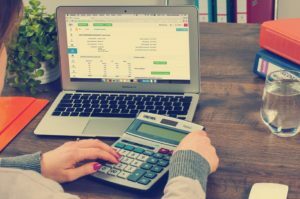 Not only will it make your business look more professional, but it will make it much easier to separate personal and business expenses when tax time comes. Depending on how your business is set up, it may be required by law to have separate accounts. Ask a local accountant in your area if you are curious if this is required for your business or not. Waiting until the last minute to get your finances in order is never a good idea. Procrastinating this task usually leads to additional issues down the road and by then, it is too late to have sorted out. Staying on top of your receipts and invoices will make it easier for you and your accountant to get your accounts sorted out in a timely manner. And not to mention, will help your overall business run more smoothly. By following the four tips above, you should be on your way to better, more organized accounts. The more you keep track of and have up to date, the easier it will be when tax season comes along. If you are looking for additional help with your finances or have any questions about getting your books in order, contact a professional accountant in your area. David Mills CPA LLC provides expert accounting and financial services to both small and medium businesses, as well as to individuals across Peoria, Morton, and the rest of Central Illinois. If you are looking to get your books in order this year, feel free to contact us here.